The day of the shower has arrived. What used to be the most purely functional space in a home is now the center of attention in modern bathroom design. Shower designs are more elaborate than anything we could have imagined just a few years ago. It used to be bathrooms that only had showers (three-quarter bath instead of a full bath, to use real-estate terms) were considered less desirable. Today’s showers need not take a back seat to tubs any longer. Modern showers are bigger, more beautiful and just as luxurious — if not more so — than a tub. While building codes require a shower to be a minimum of 30-inches by 30-inches, designer showers are much larger. As the shower size grows, designs are straying from the lonely stationary shower head. Today’s designs offer multiple heads at different angles and places in the shower, with different ranges of water delivery. Designers are also adding flexible handsets, shower heads attached to a metal hose. These mobile heads make it easy to rinse soap from bodies and shower walls alike. This steam shower has a six-foot lounging bench. It has four shower heads, which include a rain head and a hand sprayer. Heads attached to the shower ceiling — known as rain heads — provide a soft, soothing flow, something akin to walking through a tropical forest. Body jets are heads positioned at various points on the shower wall, allowing water to hit you from all sides, not just from above. All are adjustable, so your shower can be customized just for you. Shower towers or panels are multi-outlet designs that combine several types of heads into one unit for a luxurious shower experience. Thermostatic showers maintain a constant temperature without having to fiddle with the controls. Once a temperature is preset, the water stays within a degree or two of the desired level. This is especially valuable to prevent scalding small children. Power showers combine a mixing valve with a powerful built-in pump to ensure the flow necessary for a forceful, invigorating shower. Steam showers are all the rage these days. People have used steam therapy for centuries to encourage relaxation and a sense of well being. Also, steam inhalation is said to alleviate cold and sinus symptoms, and detoxify the body. Whether or not any of this is scientifically proven, people enjoy relaxing in a steam shower and, in today’s world, anything that can reduce stress is welcome. To create a successful steam shower, add a small steam unit near the shower to produce the steam, waterproof the ceiling with tile and add an airtight door to keep the steam inside the shower. The ultimate shower experience is turning your whole bathroom into a wet room. This design features a shower area open to the rest of the room. Wall-hung toilets and basins are ideal for this type of bathroom, which requires a drain somewhere in the floor. Tile and waterproofing are a must for this option, as well as properly sloping the floor to control where the water travels. This is not a project for the average handyman! 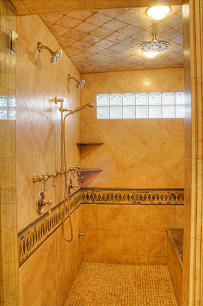 Whether you are just jazzing up the bathroom you have or going for a full-blown remodel, don’t slight the shower. It may turn out to be your favorite daily luxury and the biggest selling point in your home. As always, we welcome your home architect design questions at ask@renovationdesigngroup.com.